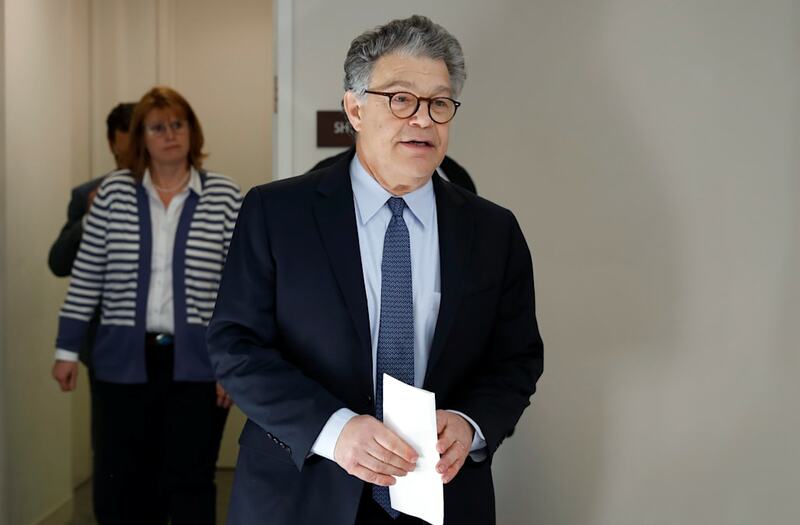 An army veteran has come forward with additional allegations against Sen. Al Franken, claiming he groped her during a photo op while she was deployed in Kuwait. Stephanie Kemplin, 41, told CNN she met the Minnesota Senator while he was still a comedian and writer on a USO tour back in 2003. He was visiting the American troops in Iraq while she was stationed in the Middle East. Kemplin, who was 27 at the time, was among the many who lined up to snap a photo with Franken. The army veteran, who worked as a military police officer, said the contact lasted to the point where she knew it wasn't an accident. "I remember I kept thinking, is he going to move his hand? Was it an accident? Was he going to move his hand? He never moved his hand," she told the news station, estimating that the touching lasted between five and 10 seconds. The Ohio woman is the fifth to recently accuse Franken of groping and is the second to allege it took place while the senator was on USO tour. Kemplin's account is similar to those of the others who have come forward with their own allegations against the Democrat. The string of allegations come after Los Angeles morning news anchor Leeann Tweeden claimed Franken forcibly kissed and groped her while the pair were on a USO tour in 2006. Kemplin said she felt as though "the rug was pulled out from underneath" her when Tweeden came forward. In interviews with the news station, Kemplin repeatedly called incident "embarrassing" and said she remembers feeling "numb" at the time. It was particularly difficult, she said, because she had previously been the victim of sexual assault while serving overseas. According to documents obtained by CNN, Kemplin was told by officials the incident was "totally inappropriate behavior" but that her comrade was not guilty of "indecent assault." Instead she was told that she was "responsible" for allowing him to get close to her. Kemplin said she didn't say anything to Franken during or after the photo was taken. Now a federal contractor investigating Medicare fraud and a registered Republican, Kemplin said she struggled to re-acclimate when she returned home from Iraq. She suffers from post-traumatic stress disorder and has trouble sleeping. "I was in a war zone ... You were on a USO tour. Are you trying to boost the morale of your troops or are you trying to boost your own?" she wondered. "I just feel sorry for that young girl in the picture."